Our largest fishing boat, the Coolcast, is known as one of the best Key West fishing charters. Run by the expert Key West fishing Captain Mike LeDrew, there is no other fishing trip quite like the one aboard the Coolcast. Captain Mike has been fishing the waters off the coast of Key West for over fifteen years, knowing exactly where to go for all kinds of excursions and all varieties of fish species. He has a strong and dedicated clientele that have discovered the perks of fishing in Key West with such experienced and friendly charter captains. Calling ahead and booking a trip on the Coolcast well in advance is highly advised. His accomplishments speak for themselves, but to truly see what this captain is all about you have to experience firsthand what the Coolcast Key West fishing charters are all about. 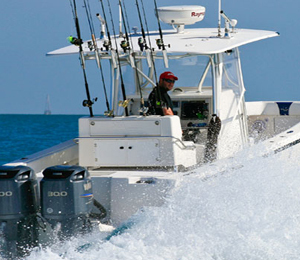 The Coolcast boat is a top-of-the-line 36-foot SeaVee center console that cuts through the waters smoothly and quickly. The boat provides on-board anglers plenty of comfortable seating and a largely proportioned T-Top for shade. Spacious and clean bathrooms are also available on board. Fishing electronics on board include TR-1 auto pilot, Ray marine 12-inch color fish finder, 2 VHF radios, 12-inch color Garmin chart plotter, a CD player and a cell phone. Everything you need for the most unforgettable Key West fishing experience is available on board the Coolcast with Captain Mike. Coolcast specializes in Key West light tackle fishing, wreck fishing, reef fishing, deep dropping, kite fishing, and of course Key West deep sea fishing. I have been to the Bahamas many times, but Coolcast Charters is one of my favorite trips! It includes everything that everyone should do here. As a Bahamas veteran, I can say only the best about this experience!